Zucchini sliced 1/8″ thick on slight diagonal, leave peeling on. Mix together first nine ingredients until it is the consistency of a pancake batter. May need to add more flour or buttermilk to achieve correct consistency. 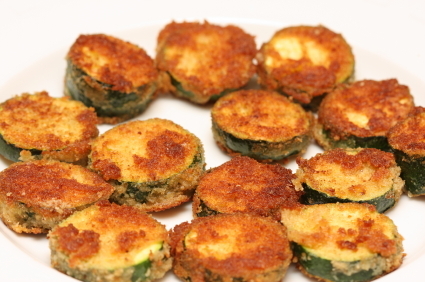 Dredge sliced zucchini in dry flour. Then dip in batter and finally coat with Japanese panko bread crumbs. Can be made ahead and placed in a single layer on cookie sheet and placed in freezer. Deep-fry in 360-F cooking oil till golden brown. When both sides are golden brown, remove slices from oil and set on paper towels to drain. Serve hot with the cucumber dip. 1. Mix all ingredients in mixer for 10 minutes on low speed to thoroughly combine ingredients.